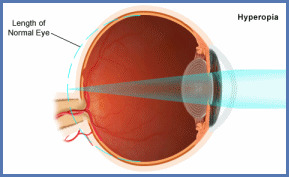 Hyperopia or farsightedness is very common, affecting up to 62% of people over the age of 40. Hyperopia occurs when the eyeball is too short or the cornea is too flat. 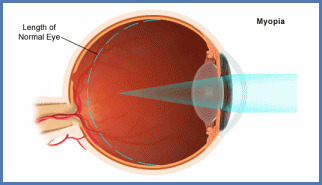 When rays of light enter a hyperopic (short) eyeball, they are focused behind the retina instead of directly on the retina where light must be directed for normal vision. Because of this, the focusing apparatus in the eye must work constantly to make up for the problem and focus images. Symptoms of farsightedness can include eyestrain, blurred vision, or headache (especially when reading or at the end of the day). Symptoms can increase over time. Young people with hyperopia (30 to 45 years) may not have any problems seeing things in the distance, but may strain their eyes unnecessarily to maintain focus on close-up objects. This ability to see things 'far away,' but not near, is how the term 'farsightedness' came into being. Middle-aged hyperopes (45 to 55 years) also may not have any problems seeing things in the distance, but may require reading glasses at an earlier age because their eyes can no longer compensate or strain to maintain near focus. Finally, older hyperopes (55 years and up) often cannot see things in the distance nor close up, which is why they need bifocals. Because hyperopia or farsightedness seems to get worse with age, it is often confused with presbyopia. Hyperopia or farsightedness requires a convex corrective lens (glasses or contact lenses), which is written as a 'plus' number in your prescription. Surgically, hyperopia is corrected by steepening the central cornea.